At the behest of President Lyndon Johnson’s Science Advisory Committee and the National Academy of Sciences, the not-for-profit URA corporation was founded in 1965 for management and operation of research facilities in the national interest. 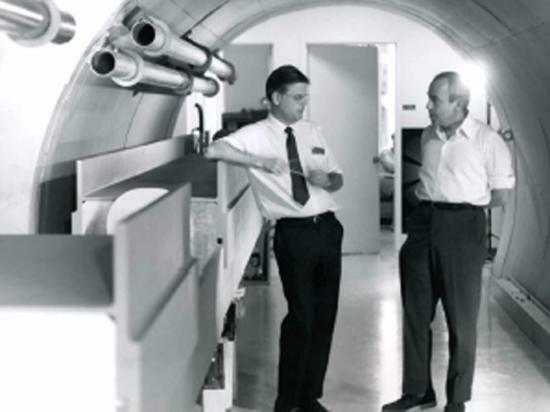 NAL Director Robert R. Wilson and Deputy Director Ned Goldwasser in a model of the Accelerator Main Ring at Oak Brook Executive Plaza (temporary location while NAL site in Weston, IL was being prepared during 1967). Dr. Goldwasser was also initially a member of URA’s Board of Trustees. 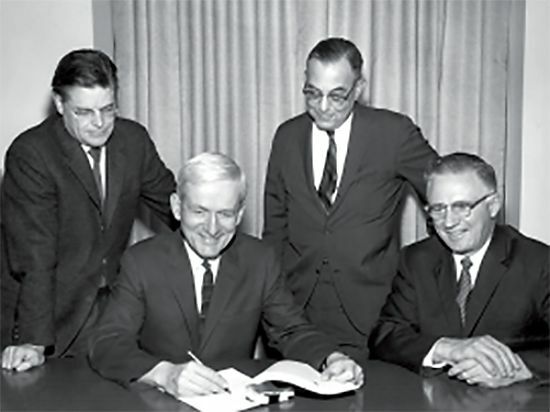 Precedent set with establishment of national-scale consortia of universities for management of large national research facilities in physical sciences; e.g., Association of Universities for Research in Astronomy (AURA) in 1957 and University Corporation for Atmospheric Research (UCAR) in 1959. AEC confronted with more than a dozen proposals for accelerators at energies ranging from 10 to 1000 GeV. President’s Scientific Advisory Committee and AEC’s General Advisory Committee appointed joint PSAC/GAC Panel (Norman Ramsey, Chair) to assess the future needs in high-energy accelerator physics. Ramsey panel recommended: prompt construction of a 200 GeV proton accelerator, plus 4 other proposals. Panel also recommended that the larger accelerator installations should incorporate an administrative structure with national representation to assure that all proposals from qualified scientists be considered on equal footing. PSAC committee of accelerator users endorsed the Ramsey Panel recommendations. Similar conclusions were made by a National Research Council Panel and in a 1965 Report on National Policy prepared by AEC staff. NAS President Frederick Seitz called 25 university presidents to a meeting to discuss the management of the 200-GeV accelerator. At this meeting, it was decided to establish a new organization, Universities Research Association, Inc. (URA), and to offer its services to manage the proposed accelerator wherever it might be located. AEC Chair Glen Seaborg requests that NAS consider accelerator site selection issue. AEC invited all states to submit site proposals for the accelerator. NAS panel recommended the six best sites, with the final choice to be made by the AEC. The first meeting of the Board of Trustees of was held. Initial Board members included L. Lederman, D. Packard, N. Ramsey, and R.R. Wilson. The Board elected N. Ramsey to be URA President. 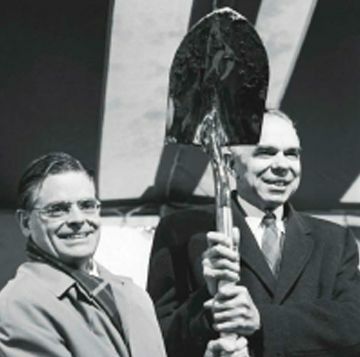 He served through 1981, the critical years for the construction and successful operation of Fermilab. The AEC announced that the site had been selected on a 6800-acre plot to be provided by the State of Illinois incorporating the town of Weston. URA submitted to the AEC a proposal for a Design Study Contract with $200,000 initially requested. 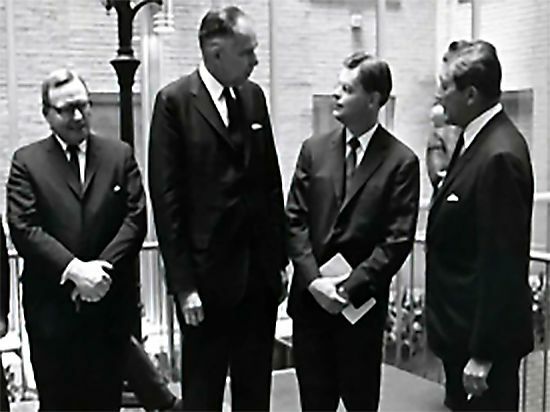 On January 5, 1967, a letter contract from the AEC was signed. URA Board of Trustees offered the position of Director to Robert R. Wilson, whose new Cornell synchrotron had just been completed one year ahead of schedule. He accepted pending AEC assurances that it would satisfy conditions to enable the project to move rapidly and to be scientifically exciting. These assurances later proved to be of immense value to the project, but they did delay Wilson’s formal acceptance until March 1967. The first URA Lab project offices were established in an Oak Brook, IL office building while the Weston site was prepared. Edwin Goldwasser from the University of Illinois became Wilson’s Deputy Director. URA President Ramsey provided strong support during the organization and design of the Laboratory. During the design interval, it was decided that the project should move as rapidly as possible to the Weston site. Since no AEC funds were available for construction, URA expended several thousand dollars of its own funds for on-site buildings (later reimbursed after the construction project was formally approved). President signed the authorization for the full $250 million accelerator project. The Laboratory had hoped for an appropriation of $102 million for construction, but $70 million was finally appropriated. The first regular contract for construction was signed between URA and the Atomic Energy Commission. Construction work proceeded rapidly and successfully. Council ordinarily meets once a year to elect new member institutions, elect members to the Board of Trustees, and transact other business. Board of Trustees consists of 15 regional Trustees elected, respectively, from 15 groups of neighboring institutions. Approximately half of the regional Trustees are scientists and half are university administrators. In addition, there are 6 Trustees at-large to represent broad sections of public interest. Board has management and fiduciary responsibilities for URA and Fermilab (under URA M&O contact with AEC/DOE). Council of Presidents, as described above. In addition, there can be up to 9 Trustees at-large, typically leaders in academia and industry. Board elects members of Boards of Overseers/Directors for each of URA-managed laboratories/facilities, as appropriate.